As an Isles fan who hates the Rangers, I still have to pay my respects and congratulate the New York Rangers on their recent playoff birth. With 93 points this season, they for sure earned a playoff spot. Yesterday afternoon, they came through in the clutch to beat the Devils. With a Carolina loss last night, the Rangers remained the 8th seed and captured the last seed in the Eastern Conference. As a matter of fact, I’m not upset about the Blue Shirts making the playoffs. This is actually great for the NHL. There’s nothing that I want more than the NHL to grow in popularity. Sorry Raleigh, but no one outside of North Carolina cares about the Hurricanes. The Rangers, on the other hand, are an original six team with a fan base that spreads across the nation. A Rangers / Capitals first round series is great for hockey. With both teams having huge fan bases, this should be a great kickoff for the NHL Playoffs. So will I root for the Rangers? Of course not. But I am happy to see them back in the postseason for the NHL’s sake. 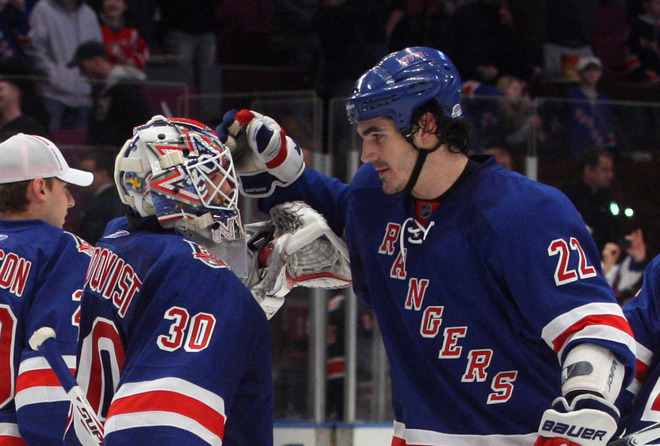 Game 1 between the Capitals and Rangers begins on Wednesday at 7:30pm on Versus. This entry was posted on April 10, 2011 at 9:20 pm and is filed under Rangers. You can follow any responses to this entry through the RSS 2.0 feed. You can leave a response, or trackback from your own site.